I’ve decided to call this whole project of revamping my wardrobe with my sister Project: Get Dressed. I really started working on it the first time at the beginning of August when I was trying to find something acceptable to wear to my 10 year highschool reunion without spending a lot of money. I found a too big broken zipper dress at the thrift store and turned it into this. Well, Heidi helped me turn it into that. And since then we’ve been working on stuff. I pick up things I love at thrift stores or discount stores from the list of basics she says I should keep an eye out for, and then she comes over and helps me get dressed and stuff. I am proud to say that after a few weeks of following directions I was able to put this outfit together all on my own for church yesterday. My first ever PGD that I worked out all by myself. I think that’s kind of a big deal. Go ahead and laugh, but this is coming from a mom who up until a few weeks ago wore jeans and a solid colored tshirt every single day. With Chaco sandals as long as there was no snow falling from the sky. This outfit has over 10 pieces, which is like 8 more than my old standard. I am totally getting better at dressing myself. Outfit Details: Pink vintage skirt, belt, and yellow Nine West purse: thrifted. Blue cardigan, zebra scarf, gray tights and black boots: Ross over the past yearish. White and gray striped tee, Walmart $3. Leaf necklace: Bass outlet. Turquoise and mother of pearl bracelet: Honolulu Flea Market 3 years ago. 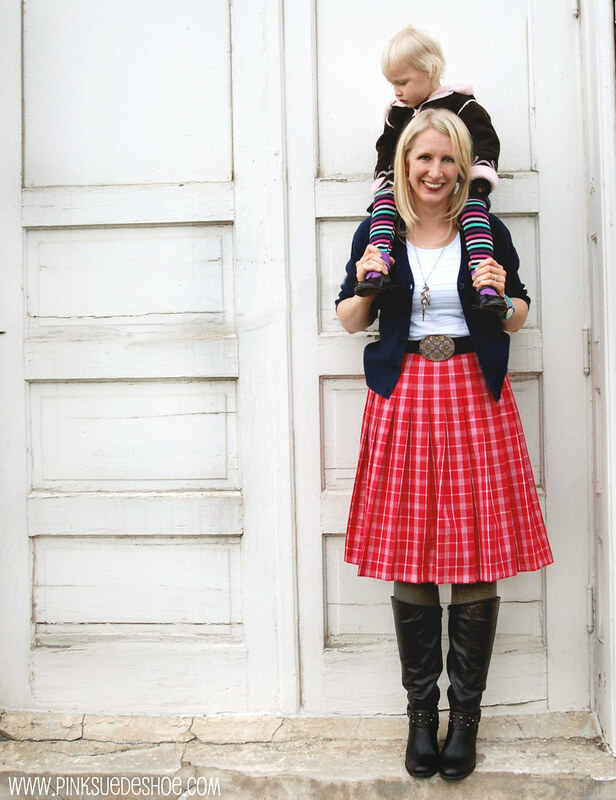 I thrifted this vintage pink plaid skirt a few weeks ago for $5. It’s a wool/silk blend. It was one of the skirts that I took to Lynette so she could alter it for me. Because it would be years before I got around to that stack and I really wanted to wear it this winter. The waist was fine (as long as I wear it on my actual waist, one of Heidi’s rules and something else I’m getting used to) but it was a very awkward and unflattering length on me. Lynette cut off the extra and hemmed it for me and I think I’ve worn it three times in the last two weeks. Which for something that has to be dry cleaned is kind of a big deal. I’m not really a cowgirl/country kind of girl, but as soon as I saw this belt I loved it for some reason and it came home with me. The little inside tab that sticks into the belt hole is a tiny little metal saddle. It’s like real cowboy stuff here. And it goes with a lot more of my clothes than I would have imagined. Maybe I really am a country girl… who knows. These gray tights are my first big girl pair of tights. Real live comfy cozy and warm tights. I’m sold. It also helps that these are fleece lined. The first time I put them on I texted my sister and told her that I was wearing sweatpants to church. They are that comfy. Fleece lined tights in every color is a new high priority on my shopping list. They are amazing. Heidi is going to explain the rules for wearing a white tshirt. The first rule is don’t do it. The second rule is you can wear a white tshirt as long as you follow these other rules and whatnot. She’ll explain it better. In my book this doesn’t count as white because it has gray stripes on it. And I wore my zebra scarf the whole day and you couldn’t see it anyway. I just took it off so Scott could take a picture of my necklace and belt, which no one else saw the whole day because of the scarf. So since you couldn’t see the not-exactly-white shirt I don’t think it’s breaking a rule… of course I could be wrong. HA! 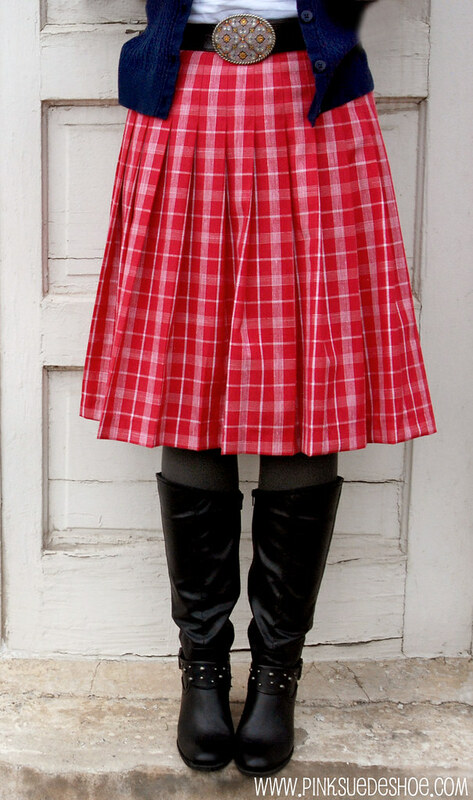 Previous Project:Get Dressed posts Vintage Plaid and Leather, 10 year Reunion. So funny. 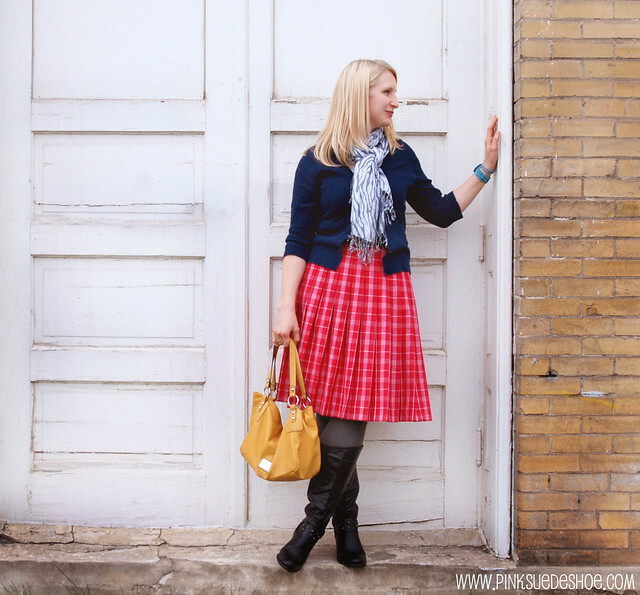 10 pieces in an outfit is about 8 more than what I typically wear too! And I have never figured out how to wear a scarf. You pull it off so nicely! Thanks for sharing these, even though it wasn’t easy for you. Good job on the outfit! You might have just inspired me to shake things up around here. I am forever in jeans…. I think sometimes it would be nice for me to put a little more thought into what I wear everyday and not just grab whatever is clean and the least wrinkled .. which is what I usually do. have a great and spectacularly well-dressed day! Okay, that is the most adorable outfit! You look fantastic and classy and totally put together–but then I’ve always felt that way about you. We’ll have to go thrifting together some time. Great outfit! Please send Heidi once you’re done with her. I don’t know what all of Heidi’s criteria are, but you look great. 🙂 I love the skirt, too. So completely you. Good job. Gorgeous outfit & model! You look fabulous. Excellent thrifting. I love the colours in the skirt. I feel the same way in so many regards from the chacos, jeans, solid tees to feeling so dorky posing and posting photos of myself. You look great and I love your styling with the accessories, yet another aspect I’ve yet to delve into!